can, but there are other activities, too. I'm very sri. I called you on 14261.... There were a lot of stn at the contest and make qrm. We go back to my home-qth on 02.09., so I have to pack my Trx and the antenna on 01.09. So we can try again on 30.08. or 31.08. between 14 and 16h utc. 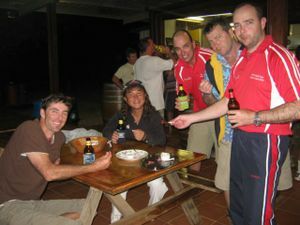 In 2011 we come back to this island. Look at qrz.com. I you wont, habe a look to my site www.df6bl.eu / links / Hallig Langeness (click the picture). You will find pictures from this island and my qth. 73, all the best to you and yours. If you are possible, please be QRV CW mode too. >Normaly I'm qrv daily from 14-16h utc, but I will look for you on sunday, 29. 08., 10h - 10.30 utc on 14.260 Mhz (+/-). My map says good cond from DL to J on 10h - 11h utc. >73 and I hope, we catch as on the band. In EU, we have 188 IOTA-EUs. I had worked 110 IOTA-EUs. I am looking for IOTA-EUs under details. Especially resident IOTA station, I am looking for thru internet. May I make our Sked for contacting with my new IOTA. Or if you have a plan for IOTA DX-pedition, please choose them. I'm sorry to inform you, that I'm not often in my hometown in Lofoten. I now live in south Norway. But, I will keep you in mind for my next trip to Lofoten for possible sked on HF. Have a great day and good luck with your island chasing! La7dha - Per, traveling light with ic-706Mk-IIG/Vertical 18AVT. KH0 - Mike,JA6EGL as KK6WW/KH0, Yu,JE6DND as KH0R,Take,JA6JXN as AC2BO/KH0,Nori,JA6GLD as WH0AA and Mune,JR6DRH as KR1V/KH0 will be active from Saipan Island(OC-086) on 21-25 October. They will operate on 160-10 mtrs CW, SSB. 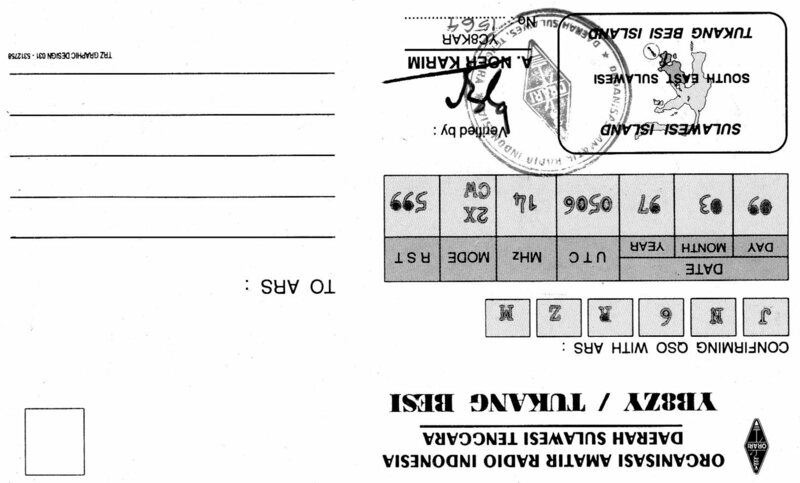 QSL direct. > I am listening on 14040 from 2100 to 2300. J**** 23/7/10 @ 1**2z on 40 mtr CW. J***** 22/7/10 @ 23** on 20 SSB. Only very good operators get that many GOOD QSO's in log. Congratulations to you all. > I collected QSO datas from Japanese donars. > Please send me all QSL cards. > All donators will be happy when I receive QSLs from you. P.S. I am supporting for you forever. "I try look for ham technique in Tokyo. > Thank you very much for your nice NA-158 operation. > I called you several times. > At last, I worked your AD5A/KL5. > Please tell me your QSL info. > I'd like to have your QSL info on my Blog. > And I already picked up invitation to IREF on my Blog. QSO and for your support. 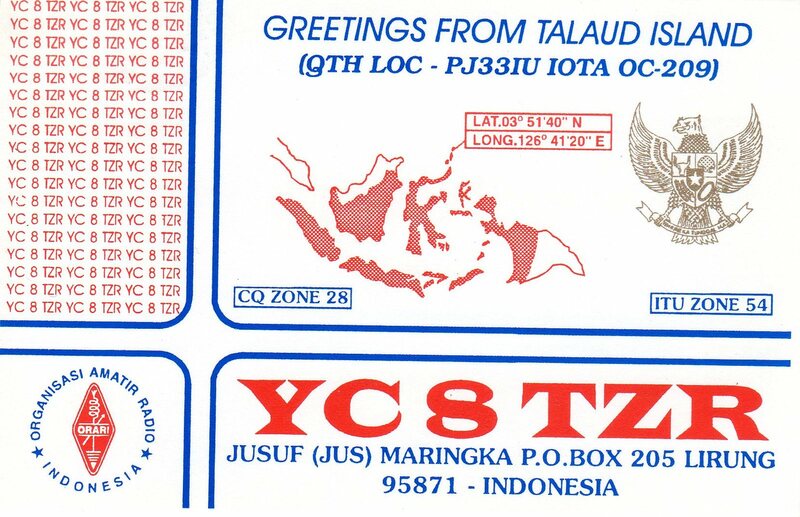 My friend Toshi/JA7MGP and Toshi/JG1UKW had worked IOTA OC-219 YB8ZY in 1997. 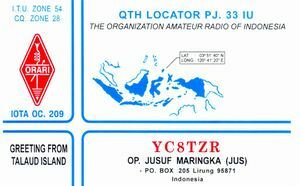 This QSL manager is YC8KAR Andi Noer Karim in Kendari. Both Toshi sent Andi their QSL card several time. 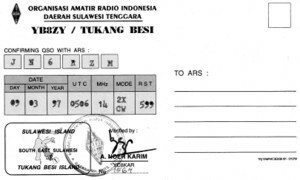 But he don't receive YB8ZY QSL card. I asked my few Indonesian friends for Andi's information. 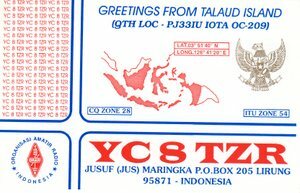 They said to me "Andi is dead already"
If you are possible, please check for managing of OC-219 YB8ZY QSL card. I am very sorry for my e-mail of supporting. Please support my friend Toshi/JA7MGP. 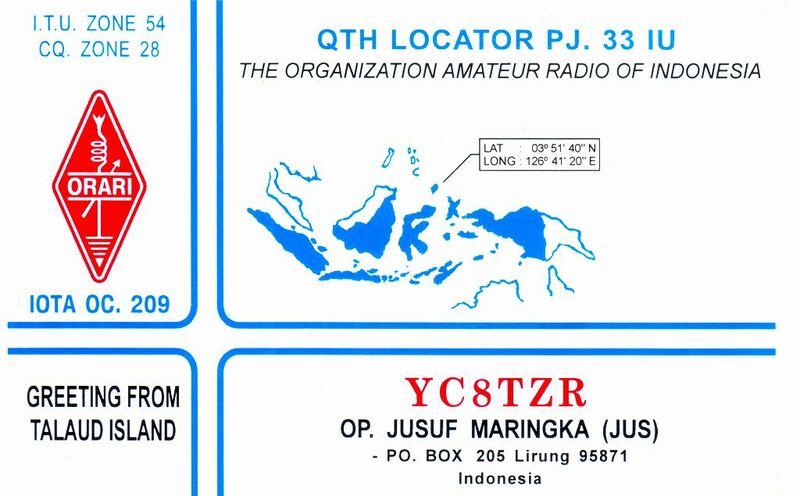 He had worked OC-219 YB8ZY Tukang Besi on 1997. YB8ZY's QSL mgr is YC8KAR A. NOER KARIM. But I and Toshi didn't look up YC8KAR adr. If you have a infos, please check this info. Glad to hear that you have received a card recently. 73 es hpe enjoy it with Sake Hi..Hi.. I'm back home last night from Kodiak. few contacts. We met with local hams of Kodiak city. I will write more detailed letter in few days, need to catch up with work now. operation. EU was at or below noise level. 100W. Wet, cold and windy. Thanks to everyone for their support and help! 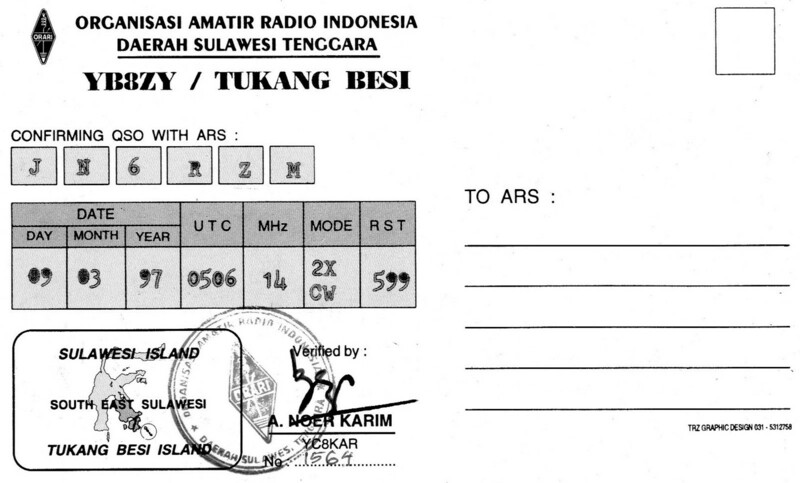 I had a Sked with EU-008 MM0LUP Ally 1st Aug 2010 last Sunday. But we didn't work each other. He said the condition is opening for JA on 18MHz. At last, I didn't hear his signals. He is nice guy. He sent me 12 e-mail. This is my great record for my Sked memory. I was shocking for my no ears. But we try again for my Sked next weekend. GAM-BARI-MASU!!! Wir ( DJ3XG und DL5ME ) reisen am 14.Aug. und hoffen am 18.Aug. in Kemi zu sein. Wir sind treffen dort die OH9-HAM's. Gaby ist nicht dabei, es ist dieses Jahr eine reine IOTA-Expedition und wir haben Naturbedingungen. Keinen Strom, Kein Wasser etc. Wir wollen 40-50 Liter ÖL mitnehmen,und Wasser für 5 Tage und für Trinkwasser für 5 Tage. Nach der IOTA-Revision aus dem Jahr 2000 sind alle IOTA-Inseln der Gruppe EU-126 nur noch mit kleinem Boot zu erreichen und sind unbewohnt. Die bewohnte Insel Ajos zählt nicht mehr. aber sie wollen uns logistisch helfen und das ist sehr wichtig ! Ja DJ3XG und DL5ME freuen sich über jede Unterstützung, wir haben sogar diesmal eine Spende von der GDXF bekommen. Man hatte erkannt das IOTA zunehmend intressanter und wichtiger wird. Wir werden also versuchen auch viel DL zu arbeiten. CW), wer irgendwie kann sollte versuchen OH9AA/p am 19.8 oder 20.8 zu erreichen. Wir werden an dem Wochenende viel QRM durch den Contest haben, nach meiner Erfahrung wird dann DX (JA, HL, W2, VE7..) nicht mehr möglich sein. Tadashi, übersetze bitte Shu (JN6RZM) diese Hintergrundinformatiion in deiner Sprache. Dann hat er noch einige Informationen mehr. Today I can redeem my promise and announce when it goes to EU-126. All other information you can find on the website.